When things don't work is one of the major frustrations of daily life. When things don't work is the negative imprint of the technology coin, where life that is supposed to become easier and more convenient has suddenly come face to face with the unexpected and unwanted. When things don't work is not to be equaled with when things don't work out. In the latter case, there is often a plan and intention involved in the process. A relationship would be a type of experiment where things, generally speaking, have two options, two possible dimensions: they can either go right or wrong. As any experiment can fail, the idea of failure does not come as a shock or an unexpected event; it is part and process of the deal. We shrug or have a tear in our eye when we say, oh well, things did not work out ... this time around. But things not working or breaking down is another matter altogether. The element of surprise in its negative sense is what makes this one so stressful. In fact, we are expecting things to go right when suddenly they do not. In my personal life, my best friend and worst enemy is the copier. 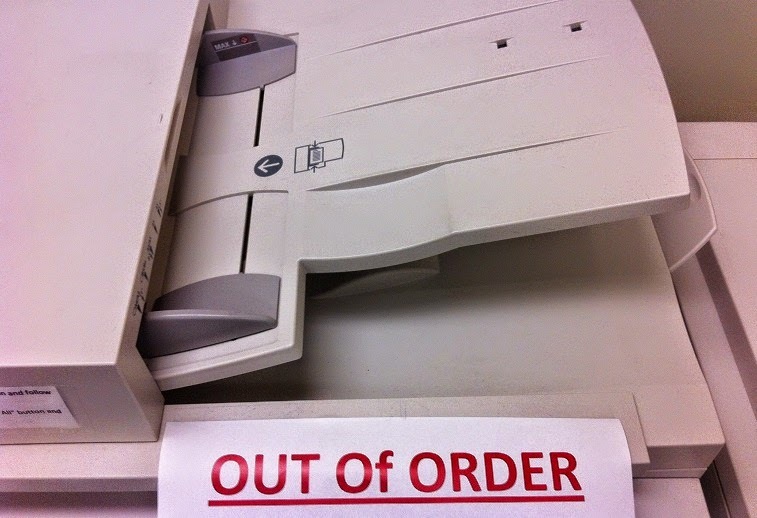 I usually expect it to work (though it has a marked history of letting me down) and when I arrive all my original sheets in hand ready to make copies for my students, the copier refuses to do its share: It does not work. Although in the back of my mind I know that it is quite possible that the copier will not work this day, it still comes as a surprise. This is why I almost always have a couple of back-up plans, Plans B and C. This goes as far as arriving half an hour early for work and ditto to job interviews. The reason for this is simple. I expect that the unexpected will arrive sooner or later. There is a chance that my bus may break down, that there will be a massive traffic jam or a detour that may cost me precious time. I am known for arriving (too?) early for job interviews but once I was actually on time. That means, I was late according to my worldview. The following had happened. The bus that was scheduled to run according to my Internet sources did not do so anymore. And I ended up doing what I had to do to make it on time: I ran. It was not a pretty sight: a man in suit and tie and dress shoes sprinting down the street, but I got there on time all sweaty and out of breath. That I did not get the job in the end did not faze me. In fact, it was me who had won the battle; I had beaten the unexpected; I had slapped it in the face, at least for that time, while I had been steadfast to my principle of being on time for a scheduled interview. Interestingly, I was once, during my undergrad years, late for an appointment with my instructor. The reason was not my oversight, but the fact that the bus had broken down. My instructor looked at me with quizzical eyes and wondered why I had come up with such a lame excuse. Sometimes the truth and lame excuses are not strangers after all. When things don't work is a part of reality. It happens on a regular basis across the board. I turn on my computer and expect it to work; when it does not, I feel the blood rushing, which turns me into the Incredible Hulk (by the way, this indeed happened earlier today, my computer went berserk and the blood started rushing, though the Hulk part is apocryphal). Others will designate the moment when they turn the key and the engine does not respond to be one of those typical bad days. Or to show up with ferocious appetite and craving at your favorite restaurant only to find out that it is closed for renovation. The list is endless and as each of us have their own list of demons and horrific scenarios, this may vary according to taste and lifestyle. Why do we feel so frustrated in these situations? Is it the feeling of helplessness? In part, it must be. We think we have everything under control and then things get out of hand because something does not work or work out as planned. It can cause embarrassment, such as those insufferable but suffering moments when I put in the DVD and the computer or DVD player will not play it for some reason. And I do not have to look at my students' faces. A perfect case of Schadenfreude on their part. And a sense of relief. Thank God, this is is not happening to me! The reason that it affects us so much is that these things do usually work. If the DVD player would never work, then it poses no problem. I would just discard it. I would immediately look for another option. If my pen does not work, I throw it away. But the thing is, when things work most of the times and then suddenly stop working for no reason, then this is the culmination of frustration. There is little we can do. I usually try to control my anger and start talking to the machine. I stroke the copier and ask him to be nice to me. On good days, I thank my computer for being there, for doing things for me. On bad days, I hope its RAM has not forgotten my words of kindness. More often than not, the worst scenario comes true, and I try to smile and later when out of sight to laugh it off hysterically. Those moments teach me a valuable lesson. Just when you thought you had it all figured out, things throw you a monkey wrench. We are indeed dependent, even slaves of things, objects, possessions and even of the idea of technology itself. We are not running the show, but are the actors. Life can be divided into two main categories when things either work or they do not. Either way, we must work it out the best we can.